I found this recipe on http://www.mixingbowl.com/ and it is a keeper for sure. 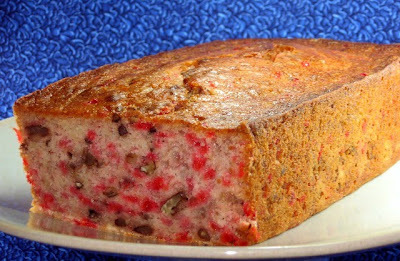 Super moist banana bread, mixed with maraschino cherries and pecans. Hubby loves this toasted with butter!! Preheat oven to 350F and lightly grease and flour a 9" x 5" loaf pan. Mash bananas and stir in lemon juice. Set aside. 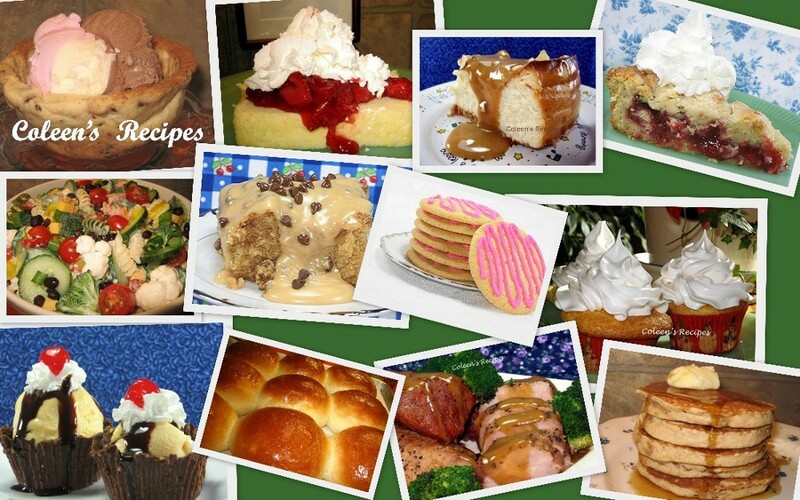 Beat butter and sugar with electric mixer until creamy. Beat in banana mixture and vanilla extract. Add eggs, one at a time, beating well after each egg. Sift dry ingredients together and add to the banana mixture, alternately with milk. Mix only until incorporated. Fold in nuts and chopped cherries. Pour batter into prepared loaf pan. Bake about one hour (my oven took 70 minutes) or until toothpick tests clean. Cool in pan for 15 minutes then turn out onto rack. That IS a terrifying tale, Coleen- I can't imagine falling through ice into a frigid river! They were sooo fortunate to have been close to the cabin-Someone is looking out for them! I'll be praying for a safe finish to their race! 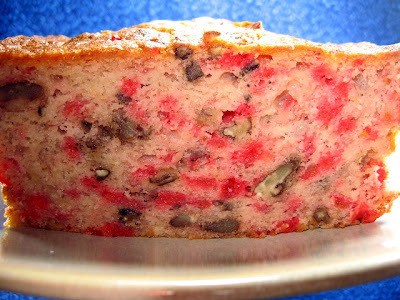 I have never tried cherries with banana bread, but it is so pretty that I'm sure it's delicious too! That is a beautiful loaf of banana bread. Looks like I have another use for those yellowish-brown bananas on my counter. Thanks again. I sure do hope your family is okay and that they are able to complete the race. Keep us posted. The colors of this cake just pop...what a great addition to plain old banana bread! Wishing your family the best of luck...and to be safe! Your banana cherry bread looks so good! Now I wish I had bought those bananas when I was at the store today! I'll get some tomorrow! Hope your family doesn't encounter anymore mishaps like that during the race! Sounds like fun though! How scary! I'm so glad it turned out so well. What a pretty colored bread. Oh that's scary Coleen! I'm glad they're okay and I hope they don't encounter any more dramatic moments. your bread seems so good ! Coleen that sounds so scary. I hope the rest of the race goes a lot better for them. Your bread looks fantastic. You know me and banana bread - I will definitely try this one too. I just made another one last week with a brown sugar topping. My quest for banana bread never ends!!!! I haven't made banana cherry bread since my 4-H days. Yummy! Good luck to your family in the Iron Dog Race. Hope they all make it safely across that finish line! Scary, story! Hope it goes well for them now! Lovely, yummy banana bread. You did the perfect thing with your bananas! Good grief...what a incredibly interesting story about the race... The conditions of this race will seem foreign to most of us...very real weather and terrain and maybe even wildlife situations? Wow. Keep us posted. Pray they remain safe. The loaf? Incredible! How scary, so glad they are safe. oh it's so pretty, i love the colors! i hope everyone is alright, let us know how it goes! Oh how scary but happy to read they are all OK. They certainly need a loaf of your banana cherry bread and some hot tea when they return. WOW! That is a very scary tale. I'll keep them in my prayers! And I think I'll bake this bread this weekend in their honor. Love the color of the bread. So pretty dotted with red. How awful! I hope the the rest of the trip is a safe one. I read your scallops comment. I'm so surprised that they were tasteless. Scallops have such a subtle,buttery taste to them normally. Were they dry? If not, they may have been infused with some sort of watery filler. Scallops should always be dry when you cook them. Hmmm?? Oh Coleen! I'm glad it was not tragic! Coleen, my stomach just roiled in fear for them. So glad it turned out all right. .
Yummm..that bread looks irresistible. Cherries have been a love from the past and am now just renewing my appreciation of them. Thank you for this delicious post.